Are You Looking for an Experienced DUI Attorney? Driving under the influence or DUI, is considered a serious offense for many reasons. Anyone facing a DUI offense will face jail time, significant fines, and a suspension or revocation of their driver's license. In addition, such cases will put a negative mark on your personal record, making it difficult for you to get important things such as affordable car insurance or even a job. When facing a DUI case, it is important that you get proper representation from a qualified attorney. In Arizona, the name you should trust is Robert A. Dodell, Attorney at Law. When facing any kind of DUI/DWI case, it is important that you are properly represented both inside and outside the courtroom. Regardless of the circumstances, you need to have someone who can defend your case and provide you with a credible legal defense. It can make a huge difference between getting acquitted (or at least getting your penalties mitigated) and being punished, wrongfully or otherwise, with the full extent of the law. Not only would you find the help of a DUI attorney useful during court hearings. You can also use their help for other matters such as dealing with your driver’s license suspension or revocation and finding the right alcohol programs or Ignition Interlock provider for you. Robert A. Dodell, Attorney at Law, handles all types of DUI cases, handling cases in Superior Court and in the cities of Scottsdale, Phoenix, Tempe, Mesa, Chandler, Fountain Hills, Gilbert and Glendale. I have handled countless cases of DUIs, ranging from minor misdemeanor cases to major felony charges. I work closely with my clients to make sure that their cases are represented effectively and professionally. Your case is more than preparing for a day in court, I can brief you about your rights, the court proceedings, potential outcomes, fines and penalties. Robert has personally handled every single one of my cases. If you are looking for a felony DUI lawyer in Scottsdale, AZ, you should reach out to Robert A. Dodell, Attorney at Law, first. There are some exceptional cases when a DUI offense is considered a felony. Given the steeper penalties associated with such cases, it is important that you get the help of an experienced lawyer. Felonies are always charged as "Aggravated DUI" or "Aggravated DWI". You can be subject to felony penalties on any DUI charge if (1) you are driving while your driver's license was restricted, suspended, revoked or cancelled; (2) if convicted of a third DUI, with a valid license, within 84 months from the first violation; (3) driving under the influence when an ignition interlock is required; (4) driving under the influence with a child, under 15 years of age, in the car; (5) driving under the influence where one is involved in a motor vehicle accident that resulted in serious bodily injury or significant harm to another person, pedestrian, driver or passenger in the vehicle; or (6) driving under the influence where one is involved in a motor vehicle accident that resulted in a fatality of another person. Read more about felony DUI offenses and penalties here. Most DUI cases are classified as misdemeanor cases. Most first-time DUI cases are classified as misdemeanor cases, so long as the driver has a valid driver's license. While the penalties are significantly lighter compared to a felony, the penalties, which would include jail, fines, alcohol screening and counseling, a license suspension or revocation, and an ignition interlock device, are still significant enough to cause you trouble. If you are facing a misdemeanor DUI charge, especially if you are a first-time offender, the legal advice of an experienced lawyer can greatly help. Robert A. Dodell, Attorney at Law is here to provide with a free initial consultation and an aggressive dui defense. Read more about misdemeanour DUI offenses and penalties here. Depending on the case, number of convictions, blood alcohol content (BAC) found in your blood stream and if this is being treated as a normal DUI, Extreme or Super Extreme DUI will determine the penalties, fines and jail time you will be facing. For a first offense DUI (BAC below .15%): At least 10 days in jail, but 9 days may be suspended only upon successful completion of mandatory attendance at alcohol screening with the recommended classes. Minimum fine, surcharge and assessment is approximately $1500. Robert A. Dodell is a former prosecutor who has years of experience in dealing with all kinds of legal cases. Since completing his law degree in 1985, Robert has worked on thousands of prosecution and defense case in his practice. His experience in handling these cases has helped him learn the ins and outs of the criminal justice system. This led him to set up his own law firm, helping people of all ages defend their rights in and out of court. Robert handles all his own cases and the goal is to obtain the best possible outcome for your case. 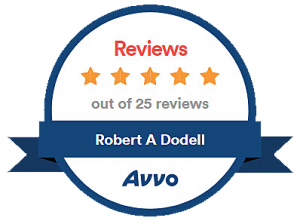 Robert A. Dodell, Attorney at Law, is a sole practitioner, who has been practicing for more than 30 years. He has handled thousands of different cases, providing individuals with much-needed legal advice and the best possible defense we can provide. Our years of experience will help you get the most favorable outcome in your DUI case. You may think that getting the services of Robert A. Dodell, Attorney at Law, is expensive. Despite his vast experience in handling DUI and other cases, his firm takes pride in providing a service at affordable rates. He understands the need and necessity our clients will have to get a good legal defense from an experienced attorney, but might not think they will be able to afford an experienced attorney. His case rates are affordable and he does offer payment plans. Robert A. Dodell, Attorney at Law, does provide prospective clients with a free initial consultation. Embroiled in a case? He is help you out. This consultation can be done either in person or by telephone. He will discuss your case with you, discuss your options and estimate the cost of his services. If you are charged with a DUI, you don’t have to surrender your rights. You have options to protect yourself. It is your right to have an attorney and to defend yourself in any kind of legal case. If you need a DUI attorney, you can approach Robert at Robert A. Dodell, Attorney at Law, anytime. We are more than willing to help you out in your case. Call (480) 860-4321 right now for your free initial consultation. Under The Age of 21 DUI Defense? Can Legal Drug Use Lead to a DUI or DWI in Arizona? Can You Be Charged with a DUI on a Bicycle? You can in Scottsdale.